Intel Cascade Lake-SP Specifications Leaked! As the upcoming Intel Cascade Lake-SP server processors are getting closer to their official release date (which my sources tell me is April 2, 2019), some more specifications are starting to leak out. Not directly from Intel, but from their system integrator partners, in this case HP, which leaked some Cascade Lake-SP SKUs and their detailed specifications. This was in some online documentation about the HP Z6 G4 Workstation, which was posted on February 22, 2019. HP quickly removed this information, but the information is out there now. 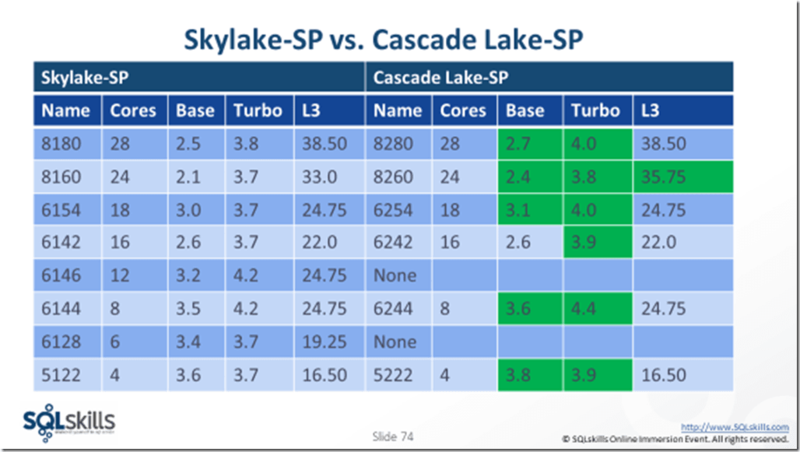 The leaked Cascade Lake-SP SKUs and their relevant specifications are shown for the most interesting SQL Server choices (at each core count) on the right side of Figure 1. This is important information if you are planning a SQL Server upgrade in the coming months! As you can see in Figure 1, the equivalent Cascade Lake-SP SKUs have fairly minor base clock speed increases (100-300MHz). They also have fairly minor Turbo clock speed increases (200-300MHz). 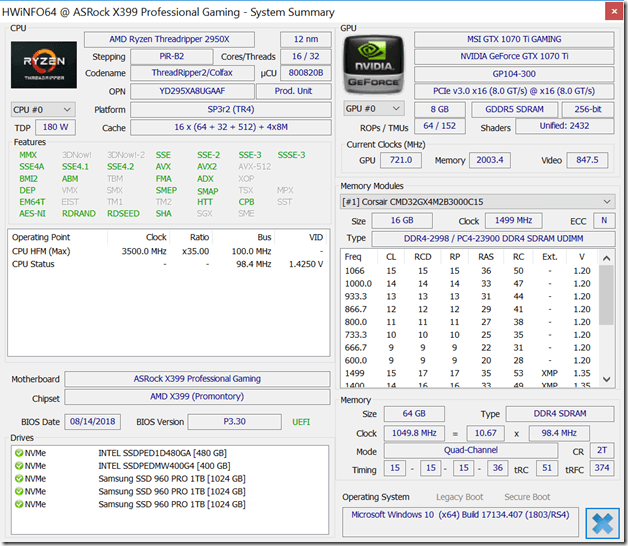 The 24-core Xeon Platinum 8260 also gets an L3 cache size increase to 35.75MB. That processor is still not a good choice for SQL Server usage due to its low base clock speed. 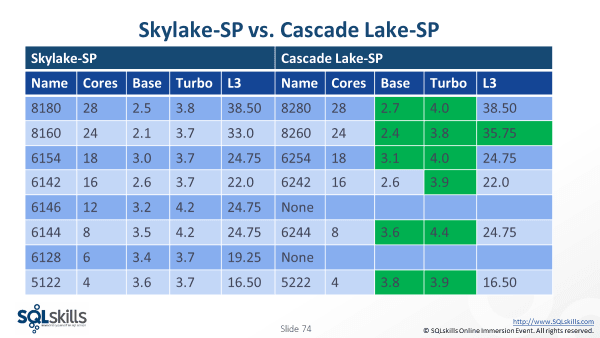 To be sure, Cascade Lake-SP does have at least two useful new features compared to Skylake-SP. The first is hardware-level protection from many Spectre/Meltdown vulnerabilities. These will perform better than existing software or firmware-level fixes. The second is support for Intel Optane DC Persistent Memory (Apache Pass). This may be useful for some SQL Server workloads. So far, there seem to be some gaps in the Cascade Lake-SP SKU lineup, with no direct replacement for the Gold 6128 or Gold 6146. I have been told that Cascade Lake-SP will be a phased rollout from Intel, with not all SKUs being immediately announced. ServeTheHome captured a .PDF version of the leaked page before HP took it down. Intel is being less than forthcoming about the available Cascade Lake-SP SKUs and their detailed specifications. This makes it more difficult for you to do informed planning about your exact Cascade Lake-SP CPU choices, and to decide whether you should wait for Cascade Lake-SP to be available or not. Another factor is the upcoming release of the 7nm AMD EPYC “Rome” processors. Intel is probably very concerned about AMD’s upcoming product release (as well they should be), which gives them even more incentive to be as secretive as possible about the details of Cascade Lake-SP. If you are planning a SQL Server upgrade in 2019, I can help you understand how to use this information to make an informed decision. What do you think about this? Are you willing to wait for Cascade Lake-SP? Please let me know in the comments. At the Supercomputing 2018 Conference, AMD announced a special high-frequency SKU in their first-generation 14nm AMD EPYC “Naples” line of server processors. This SKU will be the AMD EPYC 7371 processor. This upcoming processor will have 16C/32T, with a base clock speed of 3.1 GHz. 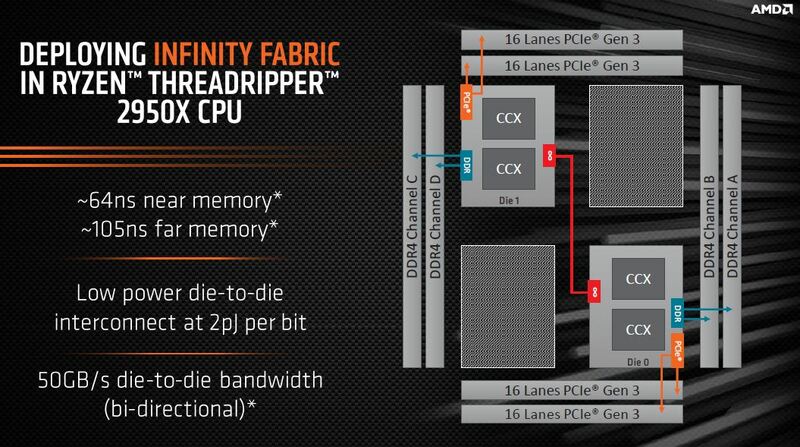 It will boost up to 3.6 GHz on all 16 cores and up to 3.8 GHz on eight cores. It also has a 64MB L3 cache. Because of this, you want to get the most performance and capacity possible for each licensed CPU core. A base clock speed increase of 29.2% is going to be quite noticeable on a typical SQL Server instance. I hope that mainstream vendors like Dell offer this SKU in their existing systems. For example, the Dell PowerEdge R7415 and R7425 would be great choices. 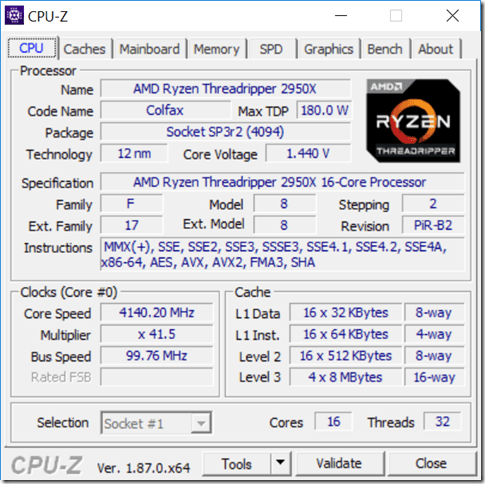 Anandtech has some more details here. ServeTheHome calls this SKU “the fastest 16-core processor” here.